AMD's Low End 28Nm GPU's to arrive in 2011. AMD’s Low End 28Nm GPU’s to arrive in 2011. A recent mobile roadmap slide leak has revealed that AMD’s next upcoming 28Nm low end GPU’s will arrive in Quarter of 2011 and will be available by Late 2011, Higher end chips would also arrive by early 2012. However, 28Nm is only limited to the Lower End cards. The Lower End cards consist of the Chelsea and Thames Chip, Both are 28nm and 128-bit but the Thames feature twice the performance as Seymour (Radeon HD 6000M). Both these chips will arrive in Q4 2011. Higher end models would also arrive by the same time but won’t be built on 28nm process. 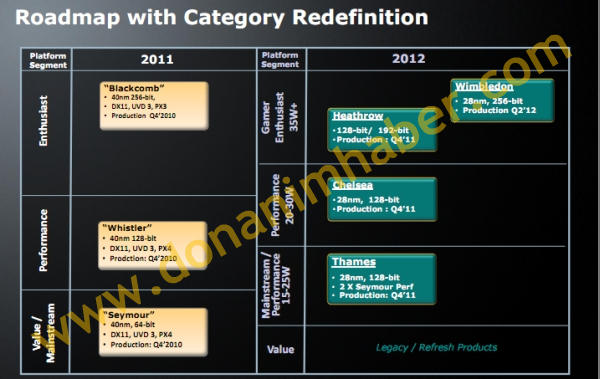 Heathrow instead will feature both 128 and 192 bit versions and would be released in Q4 2011 while Wimbledon will feature 256-bit on a 28nm process and will be released in Q2 2012.